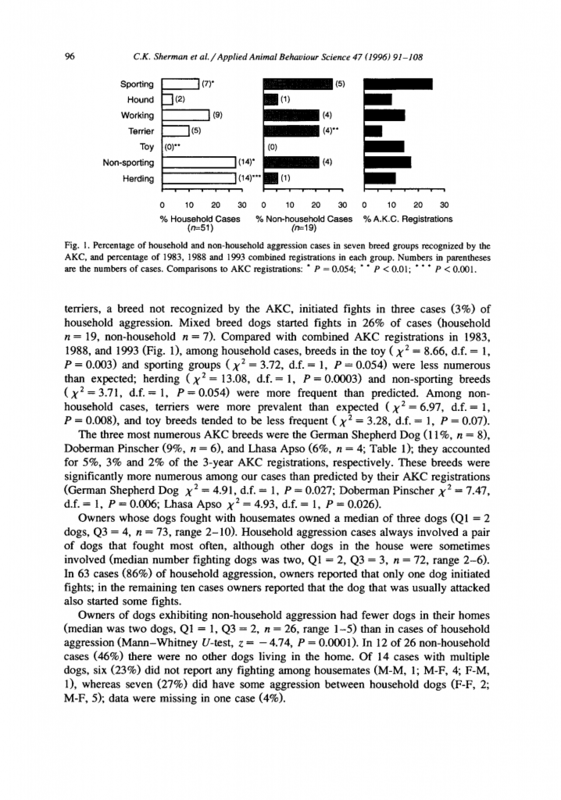 Flawed Alpha Dog theory: http://www.trainingyourdog.ca/pdf/alpha-wolf.pdf#!the-flawed-alpha-wolf-theory/c21vv. Go-to-your-mat command training video: http://www.youtube.com/watch?v=tVGaslyGaGE..
Changing a pet’s undesirable behaviors to acceptable ones requires that you understand how a pet learns. Pets learn on their own all the time-a dog who jumps on the counter and finds there the leftovers from lunch, learns that jumping on the counter has a big payoff. The motivation for this learning comes from the pet himself. When you try to teach your pet new behaviors, the motivation comes from you. The behaviors that you want are not necessarily those that your pet wants. Understanding the process of learning will make you more effective at teaching the behaviors you find desirable. jumps up and a person turns away and ignores him. food or a toy. Any time you introduce a new behavior, you need to use both for each repetition until the pet produces that behavior reliably whenever you request it. Even after the behavior seems solid, you are wise to use a tangible reward occasionally, so that the pet anticipates that any repetition may result in a reward. The intangible reinforcer, like praise, should always be used, no matter how well the behavior has been learned. We ask you to reinforce desirable behaviors and ignore undesirable ones, rather than correct them. Correction, which is another term for positive punishment, is counterproductive in behavior modification, which is essentially learning. 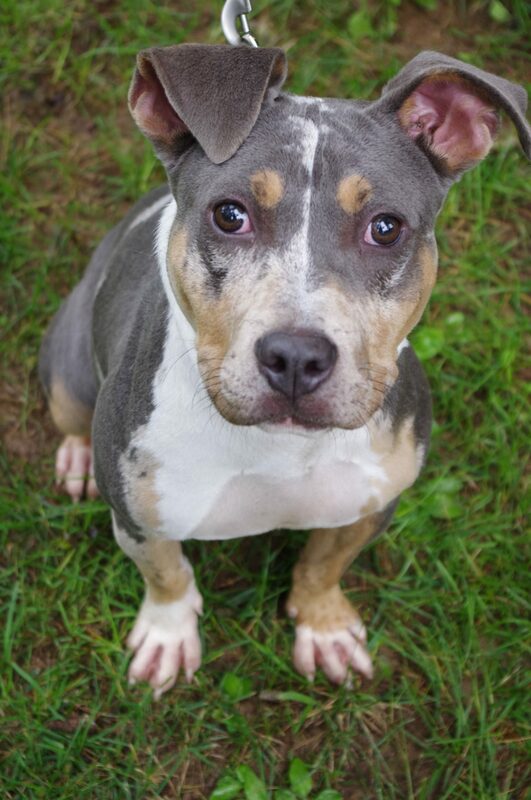 If a dog sits when requested, and receives a treat, the word “sit” becomes a promise that something good will follow the behavior it requests. 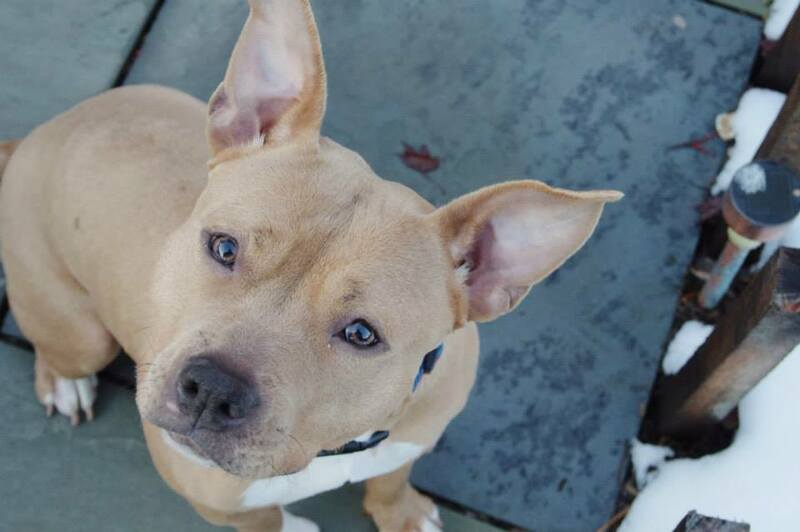 If a dog does not sit when requested, and receives a leash jerk, the word “sit” becomes a threat that something bad will follow the lack of the behavior it requests. The signal that the dogs acts on, “sit”, is now both promise and threat. The anxiety provoked by the anticipation that the word “sit” can lead to two different results, can make training an average dog difficult. For a dog with a behavior problem, a dual approach using both reinforcement and punishment may make behavior modification impossible, and even harm his relationship with you. become more effective by observing what contributes to a good day or a bad one. A mistake is an opportunity for you to learn more about the specifics of your pet’s problem, and to develop management strategies. The most reasonable approach is not to expect perfection, but to expect and work toward a better quality of life for pets and the people who care for them. term reinforcer for reward, since it describes exactly why we use rewards. strategies that are recognized as effective in changing behavior. Properly used reinforcers are the most reliable way to improve the quality of your life with your pet. praise, a clicker, or anything else that works for the pet. This will make it possible to mark desirable behavior even if the food, toy or other reinforcer is not immediately available. important to realize that since pets are nonverbal communicators, it is not possible to explain the reasons for the reward. 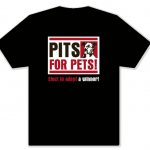 The reward must follow the desired behavior within a few seconds, so that the pet associates it with the behavior. Too long a delay will confuse the pet about what is being reinforced. This is why we ask you to pair the food, toy or game with another signal, as above. The petting, praise or clicker can be timed to follow the behavior immediately, and can be used as a bridge to the tangible reward. Consistency in the use of reinforcers is essential. You may have heard that if you use a reinforcer such as food to teach behaviors, the pet will never perform them without the reinforcer, or that you should only use a reinforcer for a short time. Remember that reinforcers are markers for desirable behaviors, and facilitate learning. Remember, too, that a behavior that is desirable to you is not necessarily desirable to your pet. For example, if he is fearful and feels the need to lunge and bark to keep a stranger at bay, you must provide a motivation with the power to overcome his own motivation to protect himself. The use of reinforcers amounts to a promise that if the dog will behave in the way you desire, you will reward him for that behavior. Anxiety creates a barrier to learning, and the long-term use of reinforcers can make it possible for the pet to pay attention to you and to follow your guidance in difficult situations. Even after your pet’s problem behavior has diminished, reinforcers do exactly that–continue to reinforce the behavior you desire as the correct one. The intensity of the reinforcer should be chosen to have an impact in the particular situation where it is used. You can use the value of a reinforcer to discriminate among behaviors. A very desirable behavior in a very difficult situation will receive a bigger reward, which will have a greater influence on the pet’s future behavior in that situation. The value of the reinforcer may also be helpful in identifying situations that are too difficult for your pet to handle. If the pet shows no interest in the reward, he is too fearful, anxious or agitated to learn a new behavior, and he should be removed from the situation immediately. You can gauge your progress by noticing when your pet is able to accept a reward in a situation which had been too upsetting for him to accept it in the past. though it will probably be in small steps. If you are discouraged, or if you feel that you pet’s behavior is worsening rather than improving, please contact us so that we can discuss strategies to manage the problem. this handout. Aggression to familiars is addressed on an individual basis at the appointment. or make a conscious effort to move, he or she reacted. If the person were in a different environment then this unconscious reaction would save the person from the snake. If a conscious thought process was needed, it would have taken too much time and a bite would occur. class, yet before and after the class their dog was a problem. This may be because their dog has learned the structure and routine of what happens in a class, the structure is lacking when people and dogs gather before and after class. techniques or even some routine veterinary procedures. There are many dogs with no known history of problematic interaction that have fear aggression with unfamiliar people. Some of these dogs may not have been exposed or socialized to different people as a 2-4 month old puppy so are wary of them as adults. 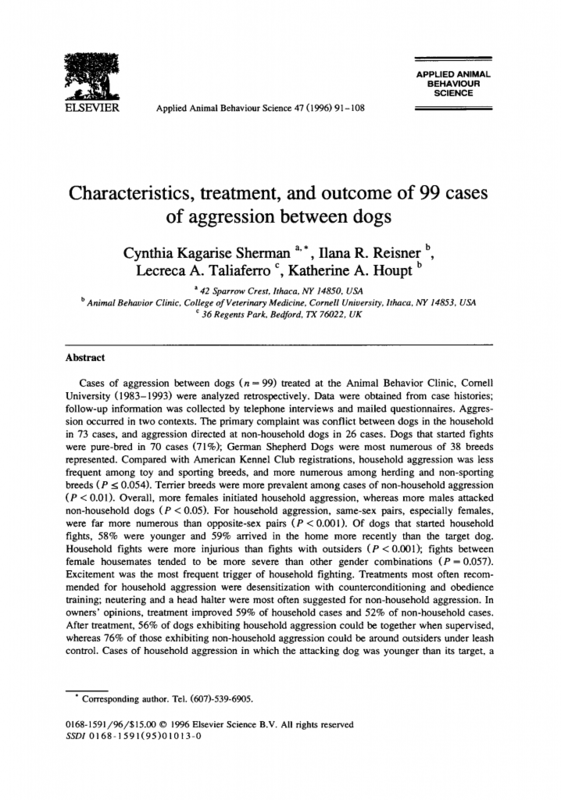 Possibly the largest group of dogs that are fear aggressive includes many of the above mentioned causes, the dogs seem to be more susceptible to adversely reacting in a given situation. The increased susceptibility may be due to abnormal neurochemistry or possibly more input from the amygdala and less from the cortex. frustration that goes along with this type of problem. A normal dog and that is afraid of someone often would look away and avoid eye contact with the other individual the normal dog might also tum away or walk away. Abnormal dogs watch (or stare at) what they are afraid of quite intently; unfortunately the unfamiliar person may inadvertently make eye contact with the fearful dog which then appears to be perceived to be a threat which then may trigger the fear response. In order to change a dog’s behavior around unfamiliar people, the dog needs to be able to relax in benign situations before we can introduce him or her to situations where he or she would otherwise react. The relaxation exercises handout addresses this. Once the dog is able to sit and be relaxed and focused on their owner with minor distractions in different rooms of the house (this generally takes three to four weeks or longer depending on how much time a person is able to spend working with their dog) we can set up a desensitization plan for the dog. It may take several hundred to even thousands of positive interactions for a dog to start to trust unfamiliar people. 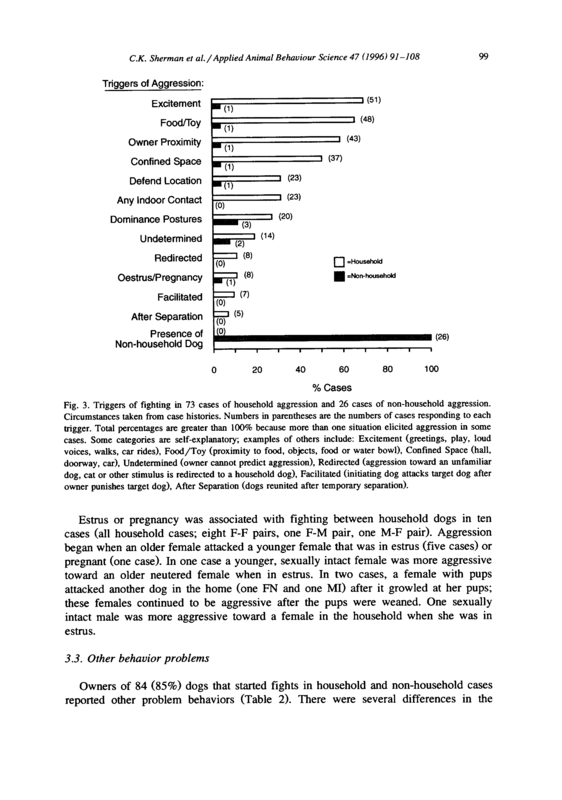 While a dog is being desensitized to unfamiliar people it is important that the dog not have the opportunity to react (and practice the previous response) to unfamiliar people. defends itself. Unfortunately, many dogs that react in this manner seem to be cute or handsome and people rarely request permission before reaching to pet someone’s dog. Many clients have told me that it was people who said they ‘knew dogs’ who ended up being bitten. These people seem to know normal dogs not dogs that seem to have “perception problems”. They often reach for a dog without thinking so the dog can “sniff’ them. 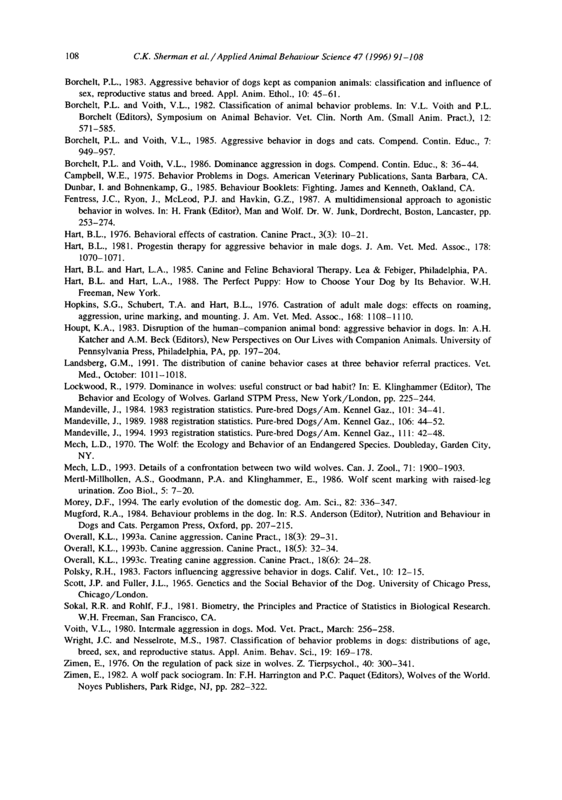 Reaching to let a dog sniff is essentially the same to a dog as reaching to pet, both are reaching in a dogs direction even though the person has a different intent, there is no way for the dog to know it. The normal behavior for a dog who is afraid is to leave a situation. I see a lot of dogs that exhibit their fear and are not normal by reacting first with growling, snapping, or biting. This reaction often occurs before the dog has a chance to think, it just reacts. 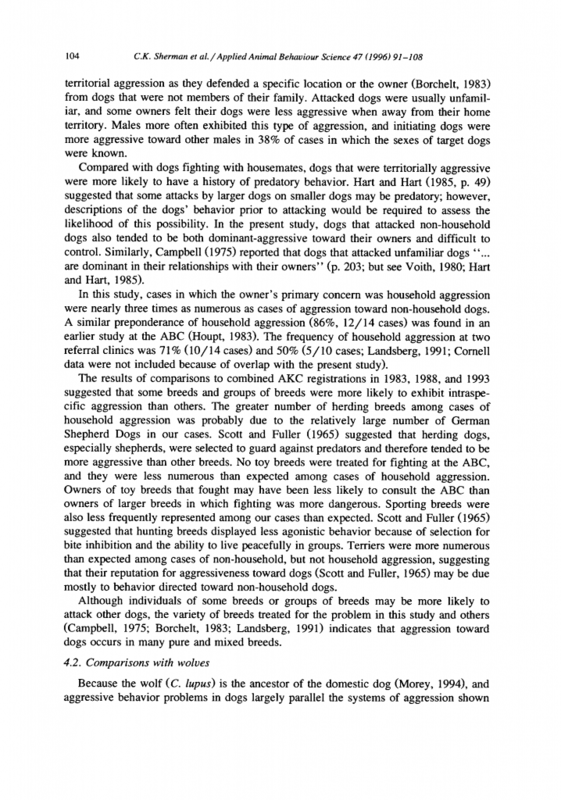 Many of the dogs that bite when reached towards give little or not much outward indication that they are wary of the individual. 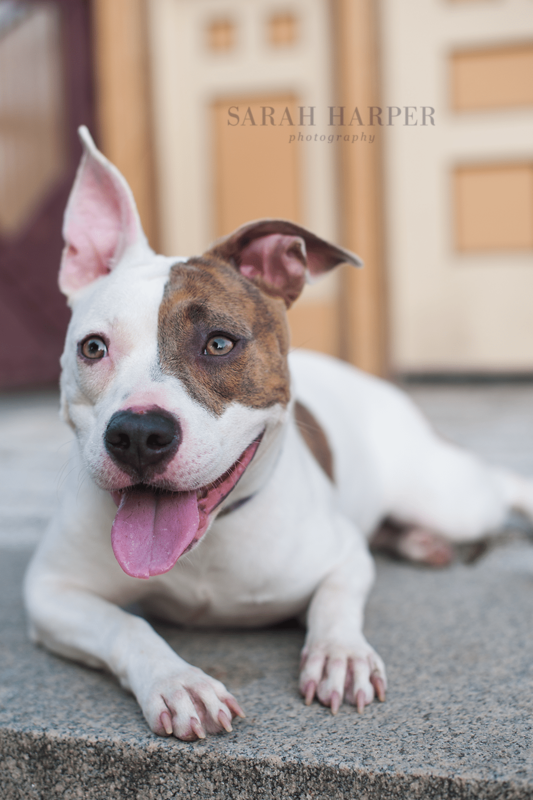 Many of the dogs approach with a wagging tail and growl, bite, or snap when the person reaches for them. People often think that the dog is approaching to be petted. Often a dog appears to approach an unfamiliar person so it can sniff the person- ifthe person does not reach then the dog sniffs and may walk away. on you. Also, just to add a little confusion, some of the dogs that I see do not show the signs of fear that most people rely on. The dogs may or may not have a tail down or it may even wag, the ears are often back but they might be up. Many times, by the time I see the dog it has “practiced” its behavior so many times that the normal cues that indicate fear have gone while the same motivation remains, leaving only the more subtle signs of fear. If a dog has defaulted to ‘fight’ instead of ‘flight’ it may not be in its best interests to look fearful (evolutionarily speaking). Desensitizing means breaking what the dog reacts to it down into small pieces or steps so it gradually becomes accustomed to whatever it would react to. 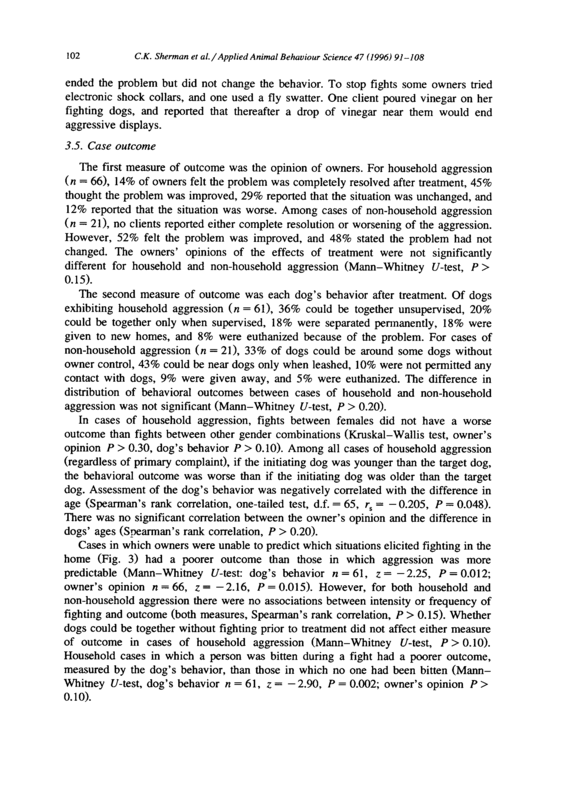 At the same time the dog is taught a different behavior that is incompatible with the one that was previously done (sitting instead of lunging). Replacing the one behavior with another is called a counter­ conditioning. Fear aggressive dogs can have a narrow or wide range of situations where they react. Treatment recommendations need to be based on information about the specific situations that distress the individual dog. These recommendations will be included in the summary sent after the appointment. 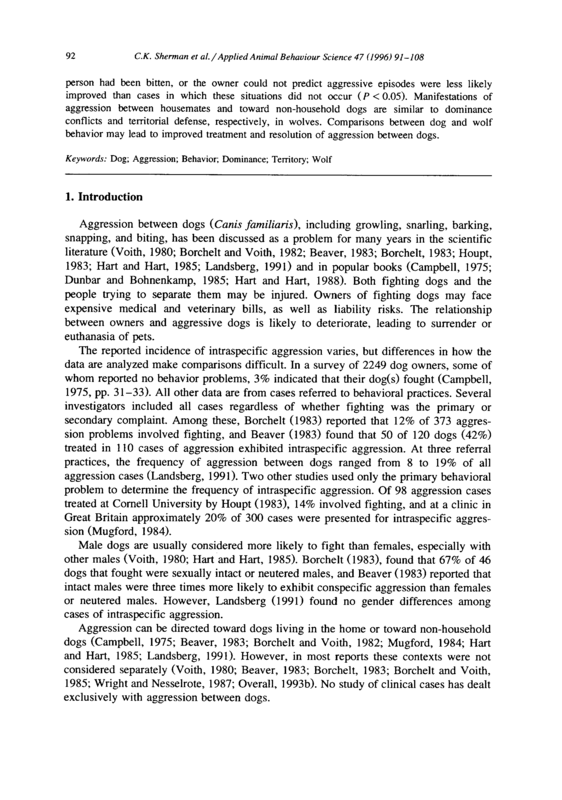 Dogs that are aggressive to other dogs usually show up in two different ways. The first, and most common, is aggression to unfamiliar dogs. 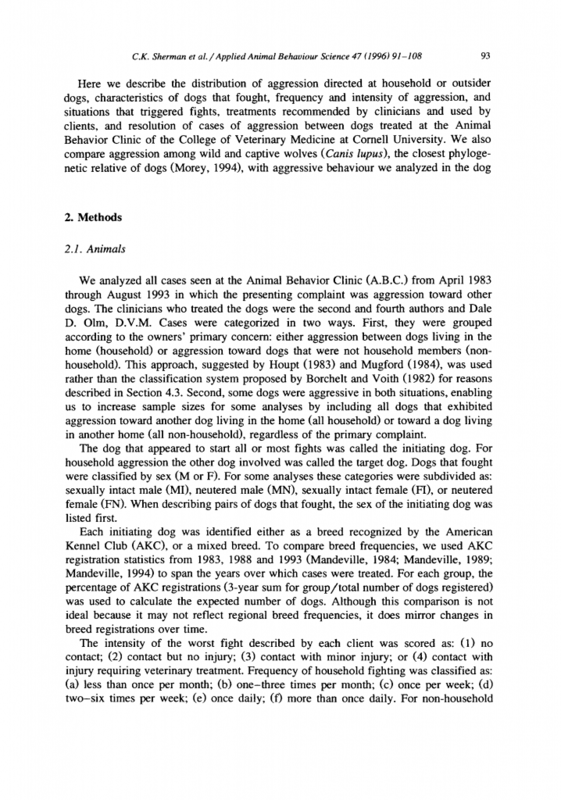 The second is aggression to familiar dogs, usually other dogs in the family. Occasionally dogs present that are aggressive to both unfamiliar and familiar dogs. snake. If a conscious thought process was needed, it would have taken too much time and a bite would occur. again, some of the initial signs may change with the repetition. One may no longer see obvious signs of fear and often clients feel that their dog is being territorial. Many times clients have reported their dog behaves worse on a leash in their own neighborhood but is better when they go other places. This may be because the dog is quite familiar with his own neighborhood and can better focus on the unfamiliar dog.In other places there may be so much going on (new things to smell and see) that the client’s dog notices the unfamiliar dog less. vehicle. 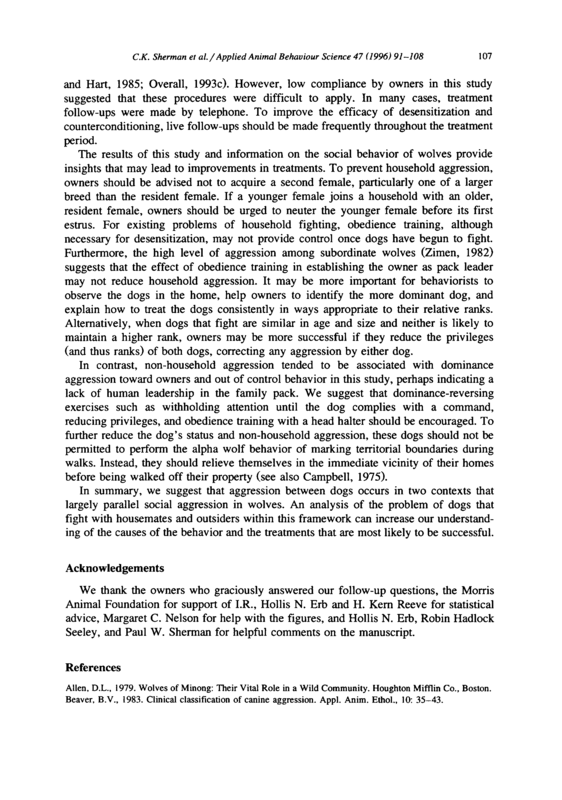 Dogs may behave worse or better during classes with other dogs. Some dogs are worse because they are in much closer proximity to other dogs and their fear increases each time they’re forced in the situation. 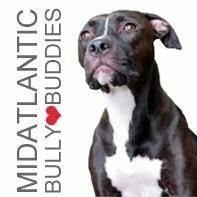 Some clients report that their dog did well during the class, yet before and after the class their dog was a problem. 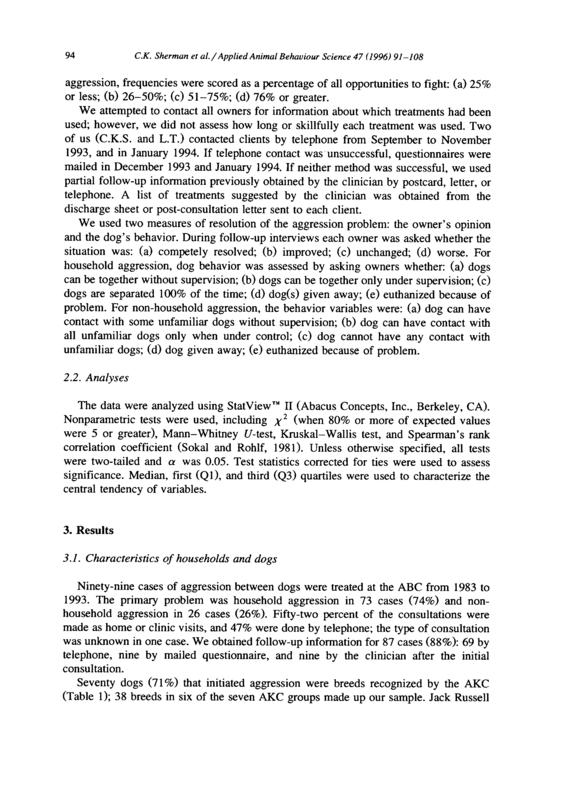 This may be because their dog has learned the structure and routine of what happens in a class, the structure is lacking when dogs and people gather before and after class. normal dog and that afraid of another would look away and avoid eye contact with the other individual the normal dog might also turn away or walk away. Abnormal dogs watch (or stare at) what they are afraid of quite intently; unfortunately the strange dog may inadvertently make eye contact with the fearful dog which then appears to be perceived to be a threat which then may trigger the fear response. 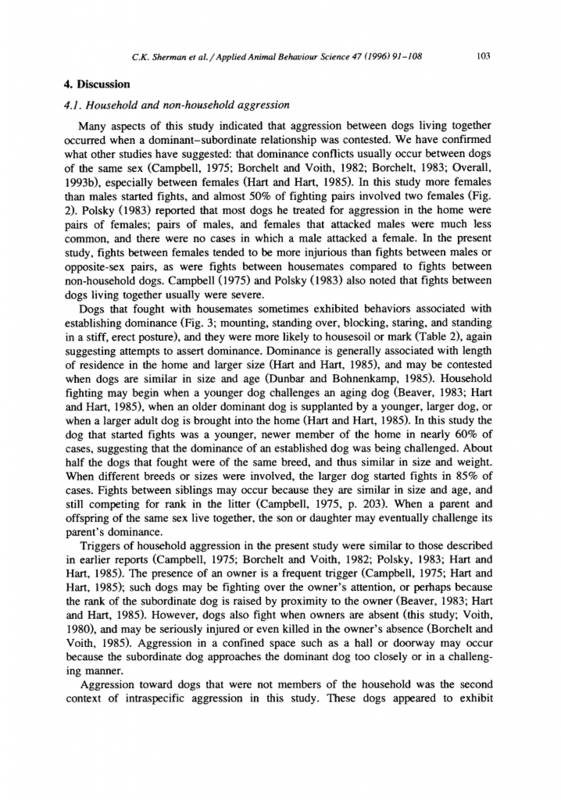 and the situations where each dog reacts to unfamiliar dogs might be different, only a general approach is written in this hand out. While a dog is being desensitized to other dogs it is extremely important that he not have the opportunity to react (and practice the previous response) to unfamiliar dogs. In a nutshell, unfamiliar dogs need to be avoided. smelling dog treats). As an owner and their dog approaches a comer or intermittently, the owner can put a small piece of the treat in their hand and hold the hand down by their side so the dog’s nose is sniffmg the hand while one walks. The owner may even be able to break off teeny pieces to reward the dog for walking next you and to keep the dog’s attention on your hand instead of on the surroWlding environment. An owner really needs to be on alert every time the dog goes for leash walks. Some dogs like tennis balls or stuffed toys and they can be brought on walks. with one giving the patient treats for ignoring the other dog. Gradually, as the patient continues to ignore the other dog the space between the dogs can be narrowed. Also, trying the same steps with different dogs. It is better to proceed too slowly then proceed to fast. is rarely that simple. The basis for the older view is the well-propagated theory that the dogs in a family are a pack analogous to a wolf pack. While dogs and wolves share much of the same in the way of genetics their husbandry is quite different. This difference in husbandry is what makes the theory inaccurate. Wolves in a pack are related, multiple dogs in a house rarely are. Often the wolf pack consists of the breeding male and female and their offspring from the most recent as well as the previous year’s litter. Depending on the food supply the offspring will disperse when they are socially mature to eventually breed. If an individual in the group does not get along with the others it disperses or leaves the area. Dogs in our households do not have the capability to leave. 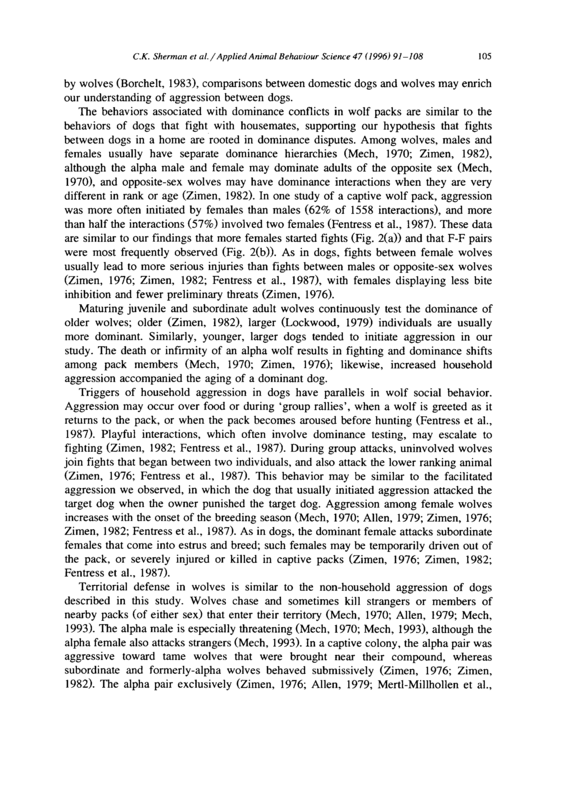 Wolves hunt together, which facilitates cooperation; dogs are fed which may facilitate competition. 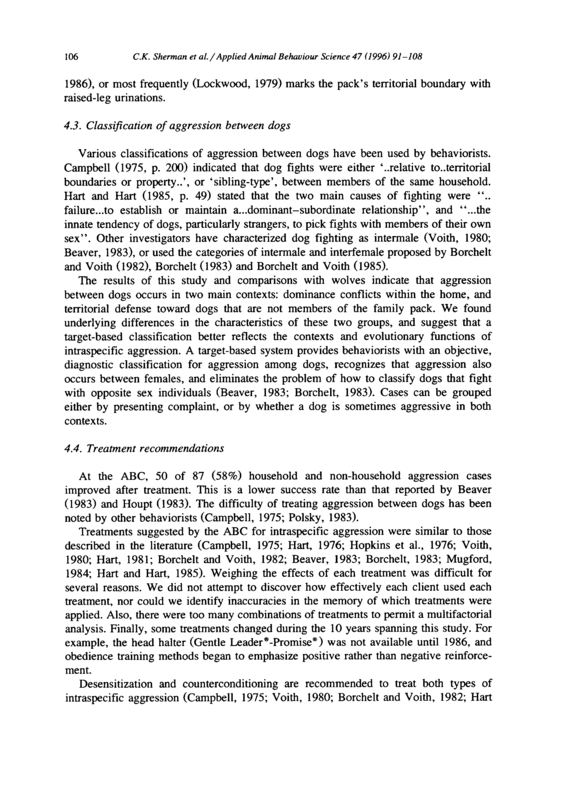 Another old approach is to do things that reinforce the social status of the dog that is stronger or healthier than the other dog. 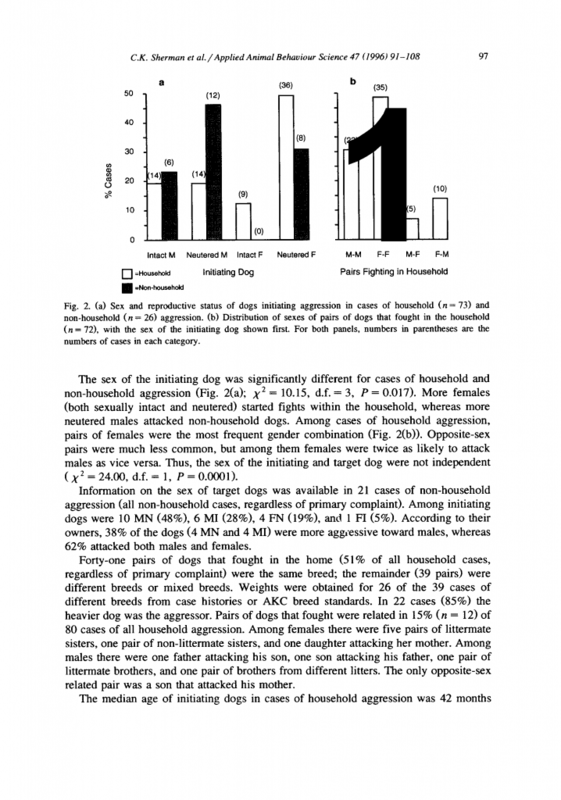 This type of human intervention often results in a worsening of the aggression, especially when it ends up decreasing the distance between the dogs. I try to figure out which dog is behaving appropriately. Unfortunately it is often the case that neither dog is behaving appropriately. 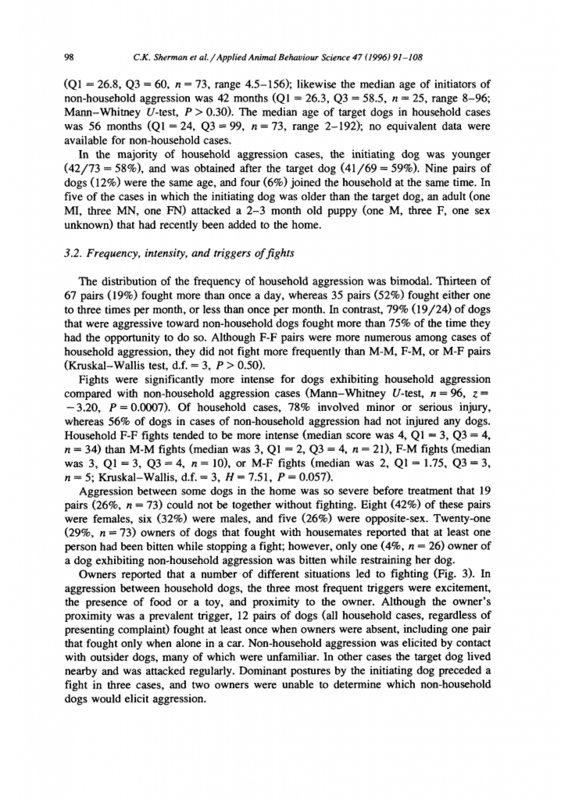 A good example is dog A may frequently try to interact with another dog B (possibly pester it) and finally dog B becomes aggressive and bites after dog B’s body language indicating it didn’t want to interact was ignored. The inappropriate one in this situation was actually dog A; and dog B’s response with a bite instead of a growl may also have been inappropriate. 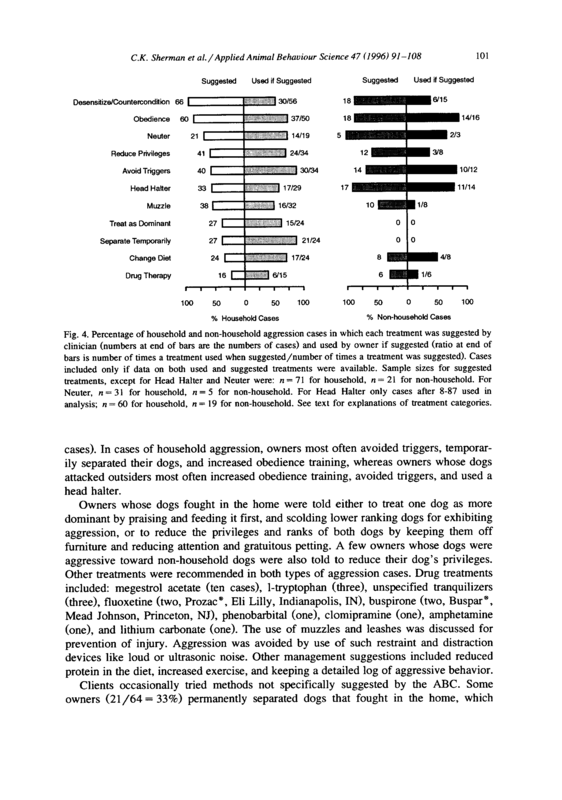 food or food related objects the dogs should be fed separately, possibly even with a physical barrier separating them (a door instead of just being on opposite ends of a room). when dogs are excited and/or anxious, the excitement leads to a heightened state of arousal, which may be a step closer to dogs fighting. Exciting situations include: people arriving or leaving, or visitors in general, with some dogs-getting leashes on, and possibly car rides. Fights can also result from redirected aggression. 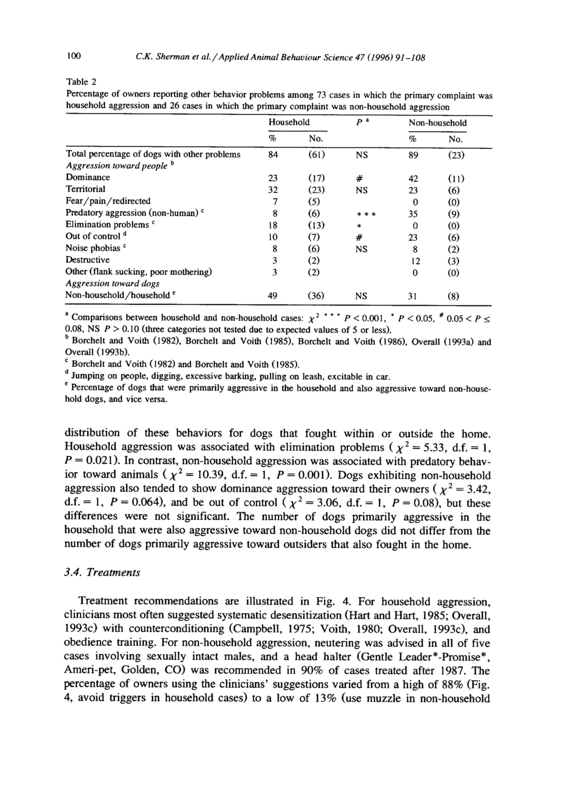 Redirected aggression occurs when a dog reacts to a second dog (often out of fear on a walk) and then reacts to its house mate standing nearby. not releasing. One should avoid using their hands and arms between fighting dogs. Many dogs reach in the air with their teeth and inadvertently end up with their owners arm in their mouth. Once the dogs are separated they should remain so for a period of time so both dogs calm down. The time period may be 30 minutes, it may be hours, or it may be days; it depends on the dogs and the severity of the fight. The primary reason for this long period of time to calm down is they release cortisol during a fight or stressful event. The cortisol then sensitizes the brain to some of the different neurotransmitters which then results in an even faster or more intense second or third incident. Treating interdog aggression with family member dogs can be difficult. The most important tool is being able to get a dog’s attention so a fight can be prevented. To do this the best, one needs to know what starts the fights between the dogs so the situation can be prevented. Further treatment recommendations need to be based on information about the specific situations. The “Look” cue can be used to redirect your dog’s attention back to you when he is focused on something else, move him past an object that frightens him, or to get him through a situation in which he would usually be barking and reactive. Although risks of biting cannot be entirely eliminated, “Look” can be a useful tool for defusing a situation involving aggression to you or another family member. As with all cues, “Look” is best used before your dog is highly aroused. When he is highly aroused, it may be difficult to distract him with any cue or food lure. 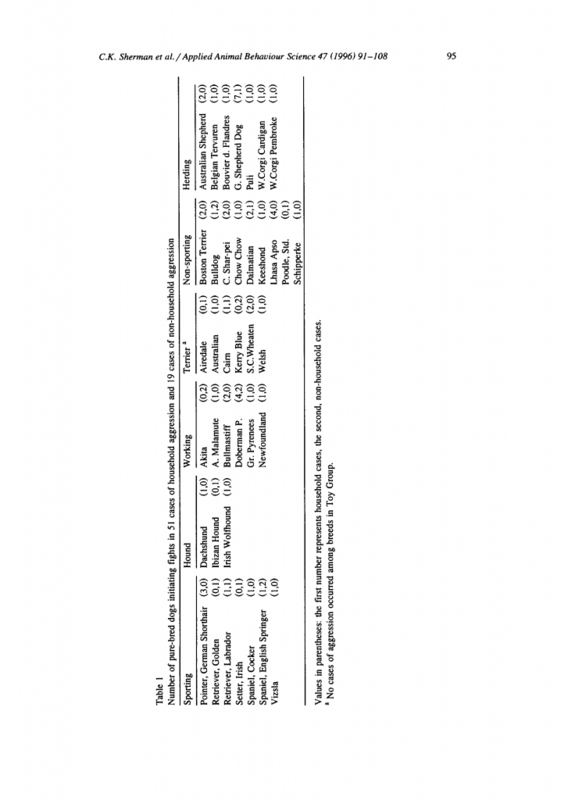 Below are listed various ways to train the “Look” cue. Use the method that was demonstrated during your appointment. get him to respond in the living room or the room that opens up to the backyard in the next session. 2. Use the most valuable food rewards for this exercise. The food rewards should be better than the ones used for any other purpose. 3. Use a small treat so that your dog can eat it quickly and you can continue to train him. 4. Your dog should be able to respond 9 out of 10 times in training situations with a lot of distractions before you attempt to use “Look” in a situation where he reacts strongly. Don’t try to use it in a stressful situation before your dog is doing it reliably in a variety of less stressful situations, since it may never become a tool to get his attention without a good foundation of practicing in a calm setting first. 5. 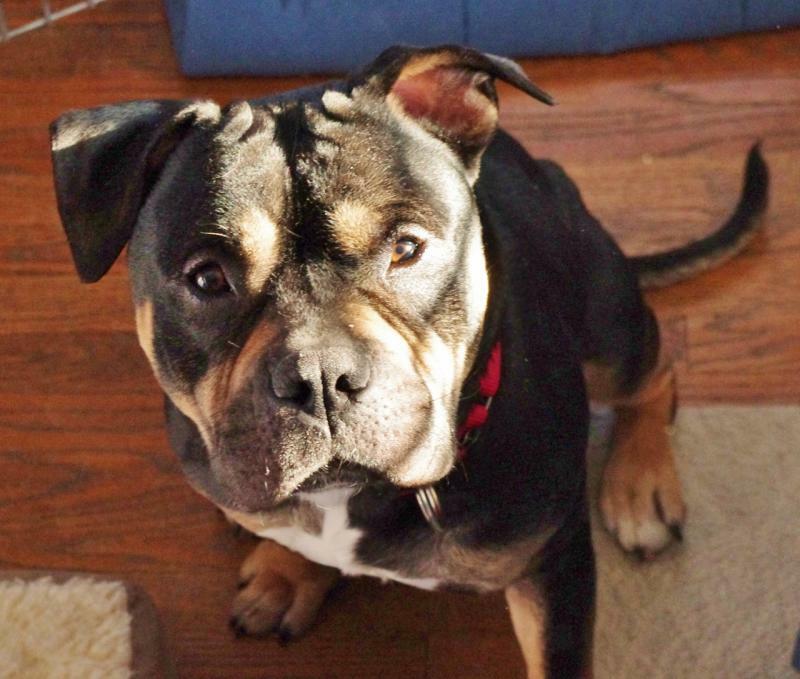 Say your dog’s name before you ask him to do anything including “Look” at you. Always pairing the “Look” cue with your dog’s name will make it clear that you are talking to this dog only.If you have multiple dogs or if you are in an area with many distractions he will always know that you are speaking to him. Remember to reward him when he responds appropriately. “Look” cue when you reward this behavior. Simply praise your dog and hand him a food reward or click and treat him. This encourages him to seek you out and offer this behavior to receive a reward. Ideally, when he doesn’t know what to do in stressful situations, he will come to you and offer attention to you which will help you gain control over him. physically uncomfortable for very small dogs to make eye contact (because they need to tilt their head back so far to look up). It is acceptable if your small dog looks up only towards the vicinity of your face or chest. 8. Sessions should be short (less than 5 minutes is ideal) and spread throughout the day. 9. If your dog refuses to look at you while you are teaching the “Look” cue, do not physically correct him. Instead, look at his body posture. He may be frightened, distracted, bored, or anxious. Try to make the exercise easier until he is successful and then end the training session. At the next session, use fewer distractions and better food rewards. If you think your dog knows the exercises and is not frightened or anxious, and he still doesn’t listen to your cues to look at you, walk away from him. (Please don’t ever walk away from a dog leaving him in an unsafe situation). If he follows you, stop, ask him to “Look” and then reward him when he does. End the training session. 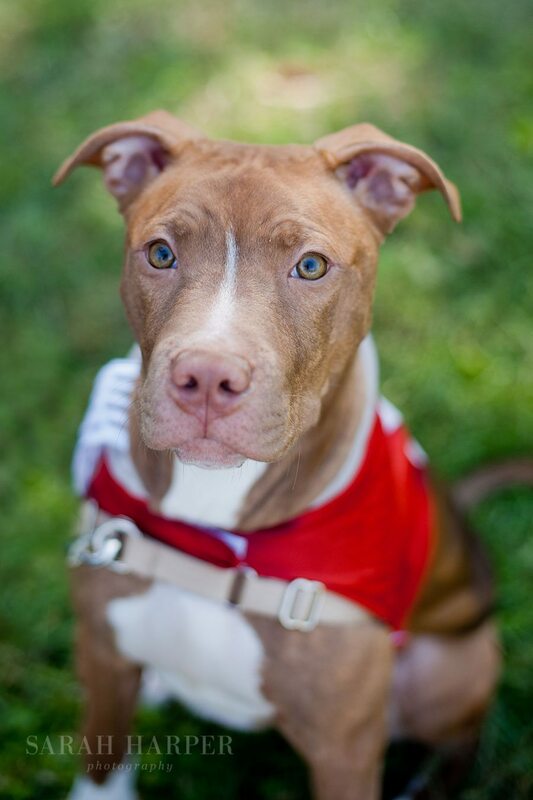 members should participate in your dog’s training and they should all interact consistently with him. If someone in the household is having a lot of difficulty working with the dog, please contact me for help. may be standing or sitting. 1. Session 1: Start with food in one hand and your other hand behind your back or at your side. Ask your dog to “Look” as you bring the food up to your eyes. Your dog will most likely follow the food and look up at you. When he does, praise him and hand it to him. 2. Session 2-3: Repeat the exercise practiced in session one many times. 3. Session 4: Practice the same way, except place the food in the hand that is not luring (moving). Continue to lure him with your empty hand and when he is right, reward him from your other hand. Some dogs will begin to look the hand that has the food.If this happens do nothing. Do not interact with him at all. Let him figure it out. He will most likely stare at your hand for a couple of seconds and then look at your face. When he does, praise him and hand him the food reward. Some dogs will begin to look back and forth from the hand with the food to your face. Be silent and still. He is trying to figure out what will earn him the reward. He is learning. When he commits to looking at your face, praise him enthusiastically and hand him 2 or 3 food rewards. 4. Session 5: Begin by luring your dog with your empty hand as you have been for 4 or 5 times, while asking him to “Look”. On the 6th try, ask him to “Look” at you without moving your hands. If he looks at you, praise him, reward with food and end your session. If he doesn’t look at you, follow the instructions for this type of behavior in Session 3. 5. Session 6: Lure your dog 1 or 2 times and then ask him to “Look” without moving your hands. When he does, praise and reward him. Continue with the training session by asking him to “Look” without moving your hands. 6. Session 7: Begin by asking your dog to look at you without any hand movement, remember to reward all successful attempts. before receiving the reward during each training session until your dog can maintain eye contact with you for 10 seconds. 8. Begin to ask him to look at you when he is turned away from you, but still within 2-3 feet. When he looks at you, even if he does not come to you, praise him enthusiastically and reward him generously. If he doesn’t look at you, make the exercise easier by moving closer to him. 9. Continue as above except begin to practice in different places in your home. Begin to use the clicker only after your dog has made a clear association between the clicker and food as described in other Clicker Training sessions. This is only if you have worked with clickers before. 1. You may begin this exercise with your dog standing, sitting or lying down in front of you. You may be standing or sitting down. 2. Start with food in one hand and the clicker in the other. Keep your hands at your side and try not to move them. 3. Say your dog’s name and the cue “Look”. When he looks at you, click and treat him. If he doesn’t look at you, make a sound with your mouth until he looks at you, then click and treat. 4. Repeat this step many times over 2-3 minutes. 5. Some dogs will begin to focus on the hand that has the food. If this happens do nothing. Do not interact with him at all. Let him figure it out. He will most likely stare at your hand for a couple of seconds and then look at your face. When he does, say his name, “Look”, click and treat. 6. Your dog may be looking back and forth from the hand with the food to your face. At first, you should reward even fleeting eye contact with you. He is trying to figure out what will earn him the reward. He is learning. Click and treat every correct response no matter how brief. Repeat this exercise up to 3 times daily until your dog eagerly makes eye contact by the time you count to two in your head. “Look”. When he looks at you, click and treat. 8. Continue as described above, slowly increasing the amount of time your dog has to look at you before you click and treat during each training session until your dog can maintain eye contact with you for 10 seconds. 9. Next, continue as described above except begin to practice in different places in your home. Whenever you increase the level of difficulty, go back to using the clicker for the initial session. When you begin to practice the “Look” cue with your dog outside of the home, expect him to slide backwards in his training. This is normal. Simply back up in the program and make the task easier, or increase the value of the reward. be off leash. If your yard is not fenced, use a 10-15 foot long line looped around your wrist to keep your dog from leaving. Begin by standing right in front of him and asking him to “Look” at you. Reward him when he is correct. If he does not look at you when you ask him to, (within 1-2 seconds), help him by making the exercise easier or using higher valued food rewards. 2. Slowly add distractions as you did in the house. Move to different parts of the yard and practice at slowly increasing levels of distraction over many sessions. Appropriate distractions include a familiar person walking past the yard, a familiar dog (that your dog gets along with) in the yard, different noises, toys in the yard and moving your hands or body. If something very distracting happens during your early session, such as a neighbor’s dog coming out and barking, end the session immediately before your dog has a chance to become agitated. 3. Continue to practice outside until he will look at you on cue within 1-2 seconds of your request. 4. When your dog has been successful in the back yard, move to the front yard and then finally on walks. 5. Practice asking your dog to “Look” at you in many different types of situation to hone his skills. This exercise serves to increase the amount oftime that your dog can look at you without looking away. Begin to practice this exercise when he responds to the “Look” cue consistently when asked the first time. 1. Begin in a quiet, non-distracting place with your dog in front of you or at your side. He can sit, stand or lie down. 2. Ask him to “Look” at you. If he does, quietly praise him. Count to 2 and then reward him with food. 3. Repeat this exercise many times while slowly increasing the time between the “Look” cue and the food reward. If while increasing the time between the verbal cue and the food reward, he looks away, he may be distracted, afraid or confused. Back up in his training to make it easier. 4. Eventually you should be able to ask him to “Look” and he should hold the contact for 10-15 seconds. Now you are ready to take it on the road and practice in more distracting situations. This exercise serves to teach your dog to look at you while he is moving so that you can walk past things that frighten him without incident. 1. Start with your dog standing or sitting on your left side. 2. Ask him to look at you and then take one step forward while verbally encouraging him to move with you. Maintain eye contact with him. He should follow you with his head up to look at you. Reward him with praise and food for his effort. take a step and then looking up at you, try to lure him into position by holding food at his nose while you take a step forward. 4. When your dog can take one step forward while looking at you, start to take 2 steps forward. Use your voice to praise him in a happy, upbeat way and hand him a food reward. As soon as you hand it to him, ask him to look at you and start over. looking at you. At this time, you are still practicing in a quiet place, encouraging him with your voice the entire time and rewarding him with food at the end of the exercise. 6. When he can do this successfully in a quiet place, begin to practice it in more distracting areas. When you do this, you may have to walk fewer steps at first and then give a food reward to make it easier for him. 7. When he is successful in non-stressful situations, you can start to use the cue to move past frightening things. This section comes into use when your dog knows “Look” but not quite well enough to follow the steps for using it on the road. 1. When your dog can look at you most situations 9 out of 10 times when asked, you are ready to use the cue in significantly distracting situations, as when a dog or unfamiliar person is approaching. 2. When you notice that you are entering a situation that could be stressful for your dog, ask him to “Look” at you and reward him immediately. As soon as he gets the treat, ask him again. Continue this until the distraction has passed. 3. If you are walking off of your property, you can ask your dog to “Look” at you and reward him while you start walking at a quick pace to get him past frightening things like construction sites, loud noises and unusual people. Reward him with every step. 4. You can also ask him to look at you and turn your body 180 degrees to go in the opposite direction. to build a foundation on which we can work to make your dog less anxious and reactive, and to repair (or establish) the relationship you have with your dog. These exercises will promote a trusting relationship with your dog by providing a pleasant, non-threatening means of interacting with him. Your dog must be able to be calm and pay attention, reliably, in benign situations before you can expect him to remain calm in more provocative ones. Like many other skills, practice makes perfect. The more practice your dog gets being calm and paying attention to you the easier it will be to use it as a tool to control his behavior in situations previously stressful for him. If your dog will give you his attention when you ask for it, you will potentially be able to interrupt problem behaviors before they happen. your dog to reliably remain calm as a basis for future behavior modification. Your dog’s job is to sit or lie down calmly on a mat while you expose him to a series of distractions. Each time your dog is able to stay on his mat and remain calm as he is exposed to the listed distractions, he is rewarded with a small food treat. The distractions or exercises are easy in the beginning but become more challenging as you progress. Although it may seem that these exercises do not address your dog’s particular problems (e.g., reactivity to unfamiliar people) the foundation that you build by practicing them will allow you to direct him to remain calm in future stressful situations. darning exercises, your dog’s ability to remain calm is the primary goal. While practicing, monitor your dog’s body language closely. If he exhibits any signs of anxiety as listed below, stop the training, ask him to do something fun and easy like ‘sit’ or ‘down’ and reward him with food. End your training session. The next time that you start training begin with a less challenging step, just before the last level at which he was successful. Food is a vital part of this process. It is absolutely necessary that we reward your dog’s calm or relaxed behavior in a manner that is valuable to him, but does not get him too excited. While there are many things that your dog might find rewarding, such as play, it is difficult to use play to reward a dog for a calm state as it may arouse him. In addition, the chewing of food is compatible with the calm or relaxed state. Dogs that are stressed and upset generally will not eat. In some dogs, a willingness to take food can be used as a measure of calmness or relaxation. All members of the household, who are willing and able, should participate. Consistency is important, as your dog needs to be able to be calm in response to different individuals. The exercises are written as a script. Your dog should be able to remain calm through each exercise before you move onto the next. If your dog should get up, simply ask him again to sit or down and continue with the exercises. Work with your dog infive-minute sessions or less. It will be difficult for your dog to remain calm and focused much beyond that. Some dogs do better with multiple 3 minute sessions. Each dog is an individual and will have its own pace. Some people may be tempted to rush through, but the goal is the process of learning and remaining calm, not the last page of the handout. Some find a task their dog cannot do no matter how hard they try, so move on to another one. variety of circumstances. When you completed all five pages, move on to working through the handout in another room of the house. Start in rooms of the house that offer the fewest distractions and do the exercises there first. Leave more challenging locations such as foyers, entryways and rooms with large, open windows for last. Work with your dog outdoors as well as inside. When working with your dog outside, minimize disruptions by choosing to work during those times of the day with the least neighborhood activity. Use a 20-30ft. leash outdoors so that you can gently draw a distracted dog back to you when necessary. Always use a lead if working in an unfenced area. something else, move him past an object that frightens him, or to get him through a situation in which he would usually be barking and reactive. Please see the handout “The Look Cue” for more information. petting your dog during these exercises; most dogs become too distracted if touched. If your dog is able to stay calm and seated or lying down during exercise, proceed to the next; otherwise you should try it again. See tips. During these exercises, you will also be teaching your dog to give you his attention on the cue “Look”. Take a food treat in your hand, raise the treat to your eye, clearly say you’re dogs name and “Look” in a slightly louder and upbeat tone of voice. When your dog makes eye contact with you, instantly offer the food reward. Timing is important here, if your dog does not make eye contact by the time you count to 2, then whistle or make a kissing or other odd noise with your mouth and give him the reward as soon as he “looks”. This technique will be used throughout the session. Once he understands the “look” cue you can fade out the hand signal. End every session by saying the same release word or phrase. Consider “OK”, “All done”, “That’s it” or “You’re finished”. Whichever you choose, be consistent. Since the only rewards you dog has received up to this point are your praise and food treats, now is a good time to pet your dog if you think he will appreciate it. Keep the food treats out of sight. If you hold the treats directly in front of the dog, he will focus on the food. Consider keeping treats in your pocket, behind your back, or in a treat bag which hangs from the back of your body. Throughout the program, deliver the food treats as quickly as possible to your dog’s mouth. The faster you give the treats, the less opportunity your dog will have to think about doing something else and the more likely he will be to stay on his mat and associate the food reward with the appropriate behavior. Use your voice, in calm soothing tones, to keep him focused; softly talk to him non-stop if necessary. Any food dropped on the floor is “free”; your dog may get up to eat the treat. After he is finished, direct him gently back to his mat and ask him to sit or lie down and then continue with the exercises. Do not attempt to retrieve dropped treats yourself. • Choose any food that your dog likes, can be swallowed quickly, does not cause him to be too excited and is relatively healthy. • Use novel foods that your dog enjoys but not so much that his excitement interferes with the exercises. • The size of the treats should be very small, about Y-t inch, and should not make up the bulk of the dogs diet. • Use low salt, low fat varities when possible and avoid foods high in fat, sugar and preservatives. • If your dog loses interest in one treat, try another. or you have any questions call us so we can help you choose an appropriate food reward. If necessary, work in a small room with minimal distractions and the door closed. Do not push on your dog, pull down on a leash or stand on a leash to get him to sit or lie down. Corrections and reprimands will only make your dog nervous. He cannot be calm or relaxed and learn effectively if one of you is upset. Remain calm and be patient; your dog will eventually understand what you want. Both of you are allowed to make mistakes! If you find that, after a few attempts, your dog is unable to do an exercise, try to minimize the distraction. For example take 10 steps away from the dog instead of 15 or softly knock on an interior door rather bang on the entry door. If your dog is still experiencing difficulty, skip over that exercise until you’re able to contact me. If your dog appears to have lost interest in the exercises (routinely gets up and walks away or seems unable to concentrate), decrease the length of the sessions and/or use a higher valued food treat. It may also help to work with your dog when he is hungry. If this problem continues, contact me. If you have multiple dogs, they should be separated from you while you are practicing. It may be acceptable to work with multiple dogs at a time depending on what we discuss during the appointment. Your dog may not be able to remain calm if he has to compete with other dogs for food rewards or try to concentrate while another dog is barking. You can place other dogs outside where they cannot hear you, ask another family member to play with them or give them a food-related toy like a stuffed Kong while you work with your dog. 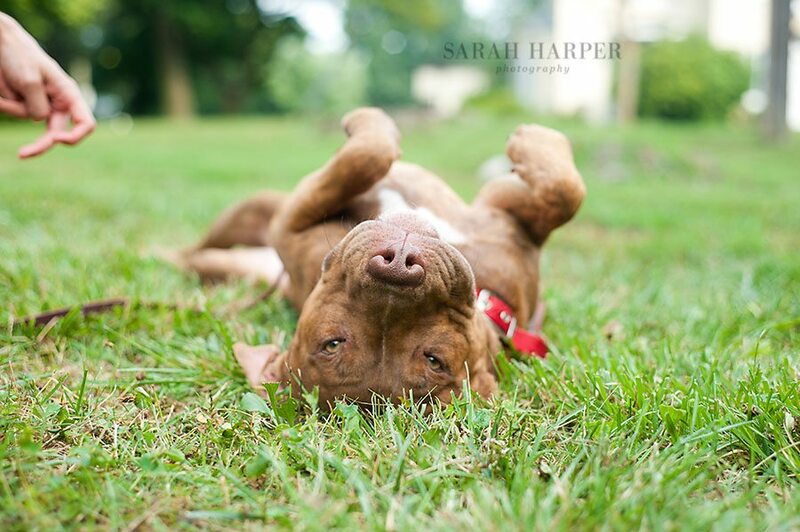 If it is easier for you and the dog to be relaxed if the dog is lying down — do that. Never reward a dog that is growling, lunging, barking, whining, consistently attempting to escape, or trembling. If your dog is showing signs of fear or aggression in response to these exercises, please discontinue the program and call me. If your dog is too anxious to lie down, these exercises may be completed with your dog standing or sitting until he is comfortable lying on his mat. Your pet may move around and may not be able to stay on the mat during his first sessions as well. Keep your sessions short (under 2 minutes) and use extra high value food rewards until your dog can be calm during this process. Do not force your dog to stay in one place. that is cornered. Remember, the point of the exercises is to teach the dog to remain calm and what behavior the dog should be doing. The dog cannot do this if he is anxious or upset. Note that you talk non-stop to the dog during these exercises. This type of talking is not usually allowed in obedience classes, but is often needed with inexperienced puppies and dogs with behavior problems. These dogs need all the information and directions that they can get. These instructions and reassurances should occur in the context of shaping or gradually guiding their behavior from one you don’t want to one you do want. You will have to learn to read subtle cues that your dog is giving and using these to your advantage.